Today was big day in the world of Major League Baseball. 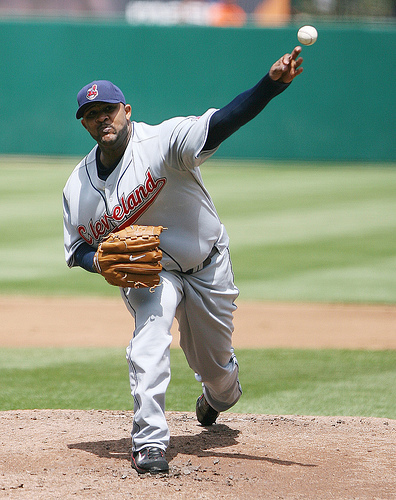 Last year’s Cy Young Award winner CC Sabathia was traded to the Milwaukee Brewers for power hitting prospect Matt LaPorta and some other unconfirmed minor leaguers. I was surprised about the urgency with which this trade went down. It seems like the Brewers never tried to low ball the Indians and work their way up. This didn’t give anyone else a chance to top their offer, so the Indians just accepted. Quick and painless. I like this move for the Brewers for many reasons. At the close of the day the Brewers sat 3.5 games behind the first place Chicago Cubs in the AL Central, Sabathia gives them another dominant, front-line pitcher to compliment Ben Sheets, giving then one of the best 1-2 punches in all of baseball. It also allows Jeff Suppan to slide back into the number three spot, where he thrived for the Cardinals before signing his free agent deal with Milwaukee. While I am a big fan of Mr. Suppan, as detailed here, he is not a number two starter. As for LaPorta, the Brew Crew may miss his power, but their Double A team is loaded. LaPorta converted from first base in his college days to outfield this year, where he’s only made two errors. This year, he’s put together an eye popping line of .288/20/66 in 84 games. They’re not exactly losing their offense at Double A since Third Baseman Mat Gamel is putting together an equally impressive line of .374/15/75. 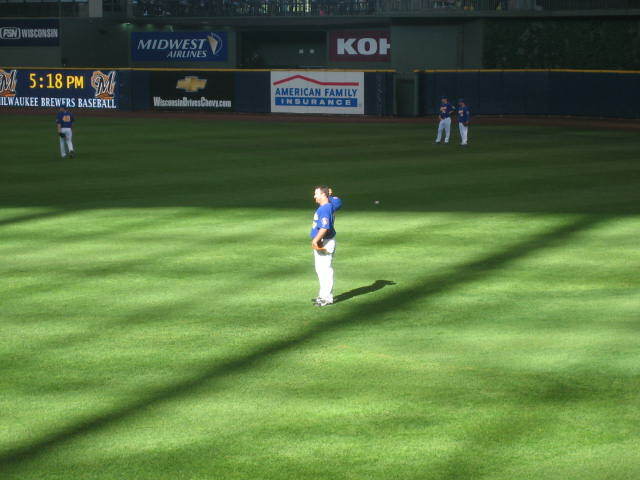 Gamel, however, has committed 23 errors in 87 games. I would look for a swap of positions in the near future; maybe 1st Base if Prince Fielder gets traded in the offseason (not as crazy as it sounds, we’ll discuss this in a minute.) The report also says that they were not forced to give up shorstop prospect Alcides Escobar who’s hitting .324/7/52 to go along with 22 steals. The Brewers are going to be set for a while. Another interesting thought was brought up by Buster Olney on Baseball Tonight. He said that if Sabathia and Sheets both leave after this year via free agency, the Brewers will have five of the top 35 picks in the 2009 Draft. That’s kind of frightening for the rest of the National League. 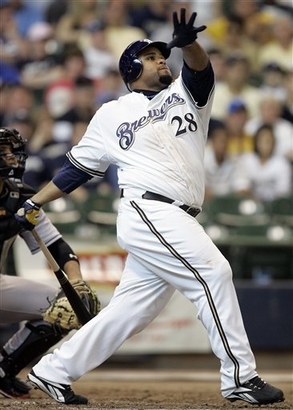 Now back to that little bit about Prince Fielder. My friend and frequent commenter, Nick, were discussing this possibility a couple days back. Back in March, Tim for MLBTradeRumors posted this about Prince not being happy with his contract being renewed, rather than the possibility of an extension. Think of the return the Brewers could get for a controllable player who is in his early 20s and has a 50 homer season to his credit. It would be something we’ve never seen before. The two comparables I can come up with off the top of my head are Mark Teixeira’s trade to the Braves last year for Jarrod Saltalamacchia, Elvis Andrus, Matt Harrison, Beau Jones, and Neftali Feliz. This was for 1.5 season’s of Teixeira if the Braves are unable to resign him. The second is the Miguel Cabrera and Dontrelle Willis trade to the Detroit Tigers for Andrew Miller and Cameron Maybin. Both of these involved superstar players under contract for over a year…but neither one has hit 50 homers. The return for Prince could be astronomical. We settled on the Giants as the team who could get him. The Brew Crew would need pitching and the Giants have the young pitchers to get it done. Tim Lincecum would be the starting point. Would it also need Madison Bumgarner and/or Tim Alderson? It’s fun to speculate. Anyway, enough Brewer talk for tonight. Maybe I’ll come back to criticize the All-Star selections tomorrow. Geovany Soto is my new least favorite player in baseball. Alright, after last night’s thrilling Game 5 of the Stanley Cup Finals, I didn’t really feel like writing out Part 3 of my journey through the upper-Midwest. Tonight, I get a little break from the Finals action and so I can continue my story. We got up early and drove the 2 hours up to Milwaukee for the night game at Miller Park. We drove straight to the stadium to pick up our tickets and then made our way over to the Miller Brewery for free beer. Unfortunately, the 35 degree weather at Wrigley the night before had given me “flu like symptoms,” as they would be called in the NBA. I felt awful, but I was determined not to let my condition get in the way of any fun that I would have. This meant drinking all the beer that was provided at the end of the tour. We got samples of Miller Lite, MGD, and Peroni and each one tasted awful. We did meet a German guy and his girlfriend from Rockford, Illinois, who we talked sports with for quite a while. He was a soccer player and told us how different the fanfare surrounding pro sports was in the United States. The tour itself was nice, kind of limited and short, but worthwhile if you’re ever in Milwaukee. Our tour guide was a Jayhawk though; he missed my not-so-subtle Darrell Arthur-math joke. 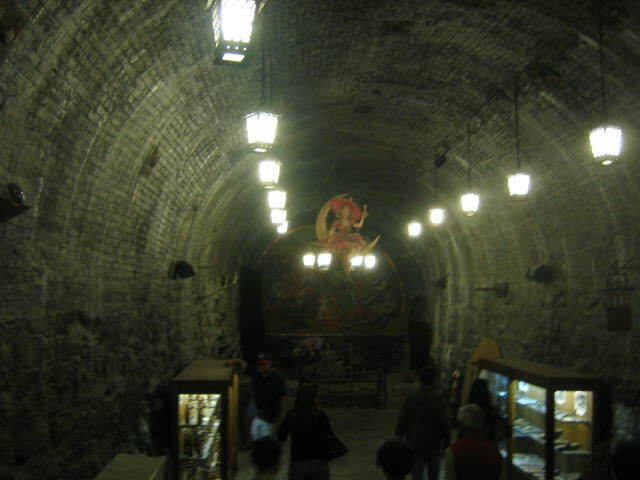 Anyway, the picture above is of the Miller Brewery Caves at the end of the tour. The first game we saw was against my Atlanta Braves, and keeping with the trip theme, it was a pitcher’s duel. We had yet to see any team score over 3 runs and this game was no exception. It ended 1-0 when Rickie Weeks tripled down the line. One of the weirdest parts of the trip occurred during this game, though. It’s something I will probably will never see again and I don’t think I can quite do it justice by describing it but I will try my best. Somewhere around the 5th inning someone lined a ball sharply into the first row. It was the kind of line drive that made the crowd “Ooooo” when it hit the stands because they realize that whoever was unfortunate enough to be in the ball’s path would probably be visiting the hospital later that night. Tonight, however, there was no hospital visit for the lady wearing a green shirt in the first row, only a souvenir. Since she was a hefty young lady, she was unable to avoid the rapidly moving ball. It drilled her directly in the stomach. And stuck there. Without bouncing. The guy sitting next to me leaned over and said, “Did that ball just…stay there?” I said it did, and he claimed that it was the craziest thing he’d ever seen. The woman looked unphased by the entire ordeal and did what any one of us would have done in a similar situation: she pulled out her phone and called someone. After the game, I still felt like I was going to die so we headed to our friend’s house and went to bed. The next day’s game was at 1 PM, so we didn’t have much time to do anything beforehand. The Braves would end our streak of less than 3 run performances with a 6-1 victory. Mark Teixeira homered for the Braves and Russell Branyan hit a bomb for the Brewers. We toured Marquette University a bit and then went home for dinner with our friends. 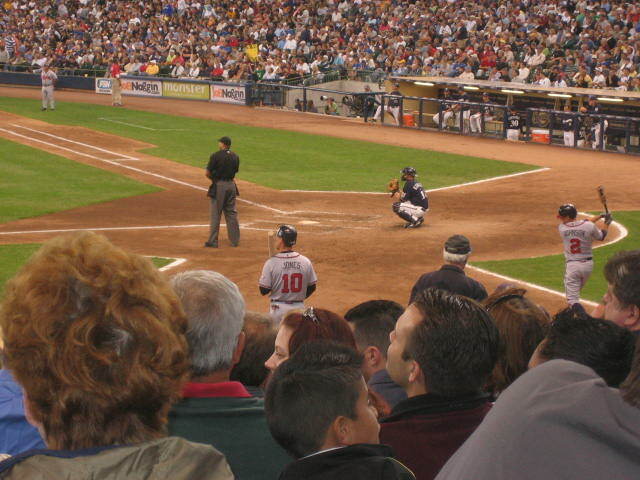 The game was a good one as Mike Cameron, Ryan Braun, and Prince Fielder all homered for the Brew Crew as they took the game 5-1. It was definitely the most lively crowd we had as several people around us kept us entertained throughout the game, but for very different reasons. The people behind had a little too much beer and almost got in a fight with the folks sitting to our left. The two guys in front of us were quite the opposite and kept most of the section laughing for most the game. I also won $3 during the sausage race off them since the Polish Sausage won. It was a personal highlight. After the game, we got some sleep before our long journey to St. Louis for our final two games.